Superior Thoracic Aperture or Thoracic Inlet is the inlet through which the thoracic cavity interacts with the root of the neck. Clinicians call the superior thoracic aperture as thoracic outlet clinicians because significant arteries and T1 spinal nerves come from thorax via this aperture and goes into the neck and upper limbs. 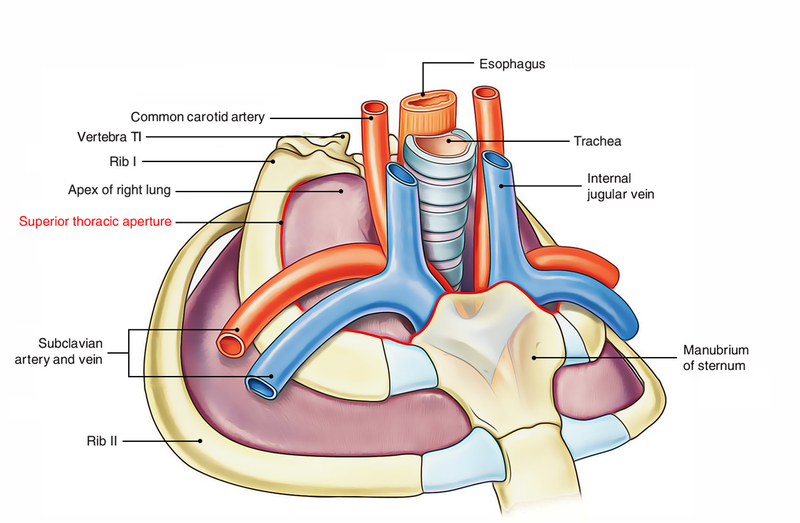 Anatomists describe the superior thoracic aperture as thoracic inlet because air and food goes into the thorax via trachea and esophagus, respectively. Anteriorly: Superior border of manubrium sterni. Posteriorly: Anterior border of the superior surface of thebody of T1 vertebra. Laterally: Medial border of first rib and its cartilage. The upper end of anterior boundary is located 1.5 inches below the upper end of posterior boundary because first rib slopes downwards and forwards from its posterior end to anteriorend. For that reason, plane of thoracic inlet inclines (directed) downwards and forwards with an obliquity of about 45 °. 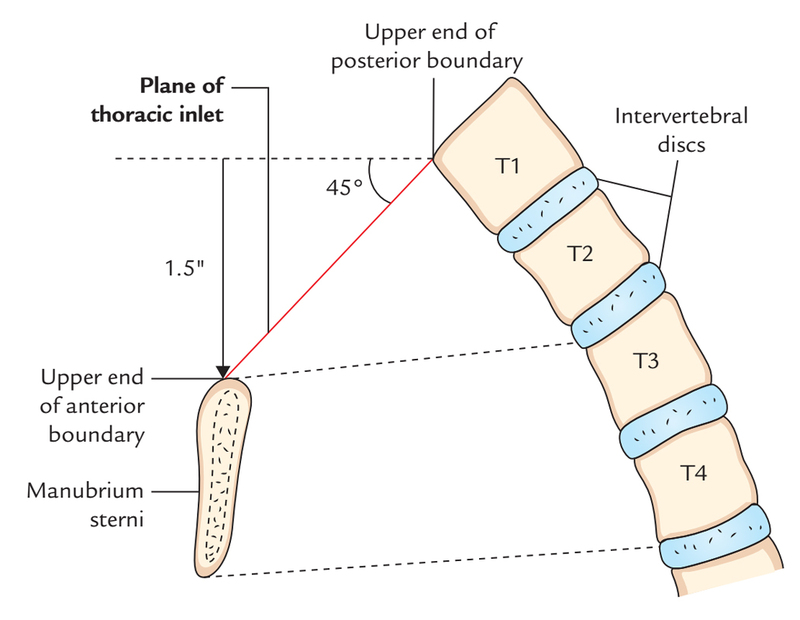 The upper border of manubrium sterni is located at the level of upper border of T3 vertebra, because of downward and forward inclination of thoracic inlet, the apex of lung with the overlying pleura projects into the root of the lung. Measurements: Transverse diameter: 4.5 inches. And Anteroposterior diameter: 2.5 inches. The part of thoracic inlet, on each side, is closed by a dense fascial sheet termed suprapleural membrane or Sibson’s fascia, or diaphragm of superior thoracic aperture. It’s tent-shaped. 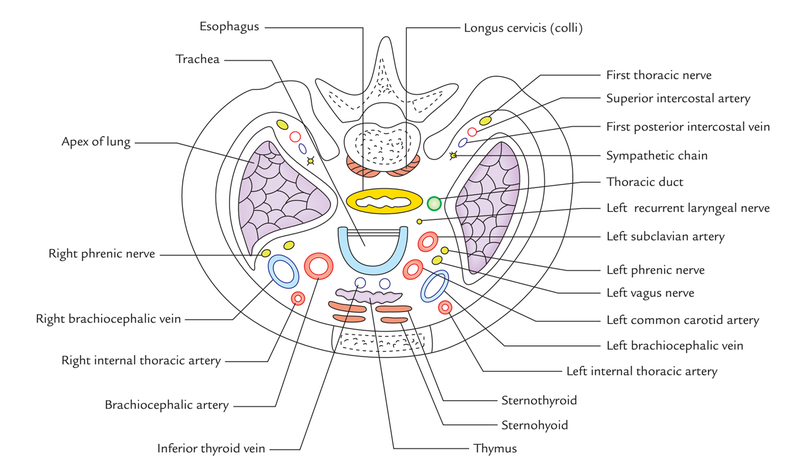 The apex of Sibsons fascia is connected to the tip of transverse process of C7 vertebra, and its base is connected to the inner border of first rib and its costal cartilage. Its superior surface is associated with the subclavian vessels and its inferior surface is related to cervical pleura, covering the apex of the lung. The functions of Sibsons fascia are as follows:. It shields the underlying cervical pleura, below which is located the apex of the lung. It resists the intrathoracic pressure during respiration. Consequently, the root of neck isn’t dragged up and down during respiration. Morphologically, Sibson’s fascia composes the spread out degenerated tendon of scalenusminimus (or pleuralis) muscle. Left and right internal thoracic arteries. Left and right superior intercostal arteries. Left and right vagus nerves. Left and right phrenic nerves. Left and right first thoracic nerves. Left and right sympathetic chains. Left and right brachiocephalic veins. Left and right 1st posterior intercostal veins. Left and right domes of cervical pleura. Apices of left and right lungs. Numbness, tingling, and pain along the medial side of forearm and hand, and wasting of small muscles of the hand because of the engagement of lower trunk of brachial plexus (T1). There could be ischemic symptoms in the upper limb like pallor and coldness of the upper limb, and feeble radial pulse because of compression of the subclavian artery.